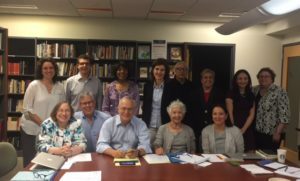 On August 10, 2017 representatives from the World Union for Progressive Judaism (WUPJ), Union for Reform Judaism (URJ), Women of Reform Judaism (WRJ), Israel Movement for Progressive Judaism (IMPJ), the Association of Reform Zionists of America (ARZA), and ARZENU, the International Federation of Reform and Progressive Religious Zionists, met in person and virtually to discuss the global Progressive movement’s efficacy at the United Nations in New York. Currently the URJ, of North America, and WRJ have six seats each affiliated with the Department of Public Information (DPI) of the United Nations. The World Union has six seats in New York plus representation in Geneva and Vienna in consultative status with the Economic and Social Council (ECOSOC), meaning WUPJ has the ability to speak and intervene during commission meetings. The purpose of the meeting on August 10 was to begin to craft a global strategy and identify key areas of interest and importance at the United Nations that best represent our constituents while at the same time potentially mobilizing congregations worldwide in campaigns that meet shared interests of WUPJ and the UN. Also joining the meeting was Hillel Neuer of the NGO UN Watch and Amir Sagie, Deputy Counsel General of Israel in New York. The result was a renewed effort for global communication and coordination in our presence at the UN as well as a basic framework for the identification of key issues, of which Israel is key. Currently, there is very little denominational presence from the Jewish community at the UN and influence is relegated to development-oriented organizations like World Jewish Congress. The goal of WUPJ at the United Nations in New York and Europe is to elevate our influence on key issues while partnering when relevant with other Jewish NGOs, other faith-based NGOs, and the Israeli Government. UN Reps are happy to make presentations at congregations or regional meetings about our ongoing work at the UN. Please fill out this form to share "Representing Global Reform Judaism at the United Nations" via e-mail.